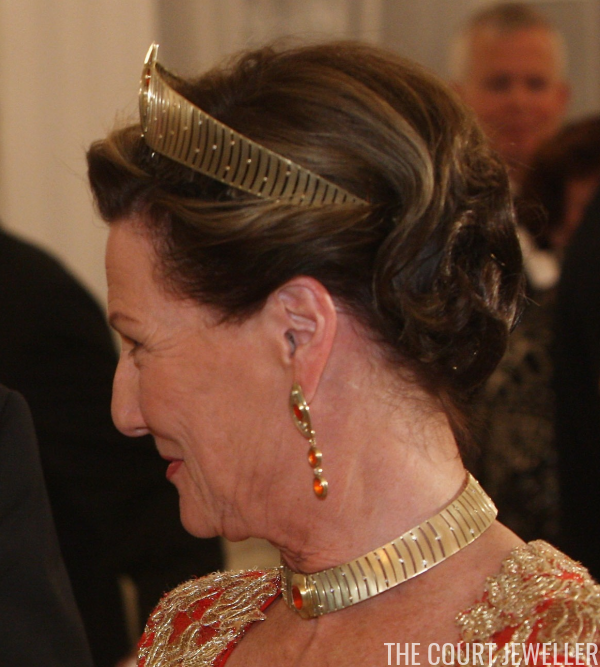 When Queen Sonja arrived at this week's state banquet, she was wearing a tiara that has become one of the most polarizing royal jewels of all: her Modern Gold Tiara. While some hail it as a modern marvel, others deride its sci-fi aesthetic. Either way, it's certainly one of the more interesting pieces in a royal collection today. The modern gold set is one of the newest additions to the Norwegian royal collection, and it certainly lives up to its name. It's been likened to costume jewelry from a science fiction film, or something unearthed from the vaults of a long-forgotten warrior queen. But for Sonja, this tiara and its accompanying parure have more sentimental value: the jewels were reportedly a present from King Harald V to Queen Sonja to mark her sixtieth birthday in 1997. The set includes several pieces. 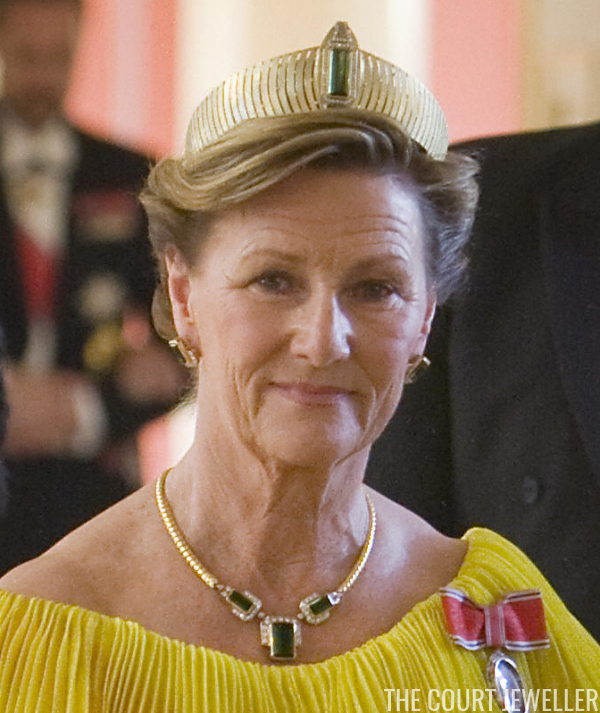 The tiara is a rare example of one set in yellow gold. There are diamonds set in the spaces between the golden slats that make up the tiara’s band. The tiara is not only an unusual piece but also a highly versatile one. The center of the tiara has three interchangeable elements: a green tourmaline surrounded by diamonds, a golden element set with larger diamonds, or an orange topaz element. Because the tiara can be worn three different ways, it needs to have multiple pieces of coordinating jewelry to go with each "look." 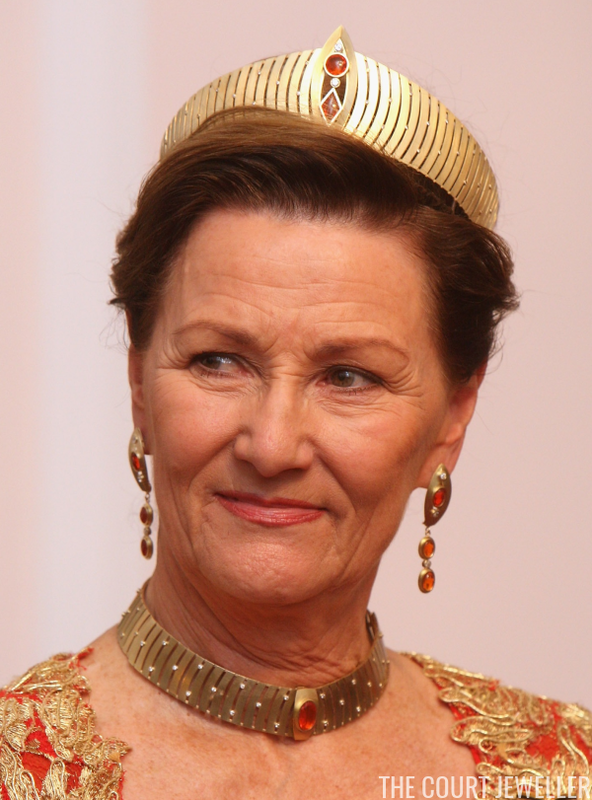 Sonja has various pairs of earrings that coordinate directly with the tiara -- a dangling pair of orange topaz earrings, a rectangular pair of gold earrings with small diamonds, and a pair of large green tourmaline earrings. There's also a choker that mirrors the gold and diamond pattern of the tiara with a central orange topaz stone, plus a green tourmaline necklace that mimics the shape of the green tourmaline that can be swapped into the center of the tiara. 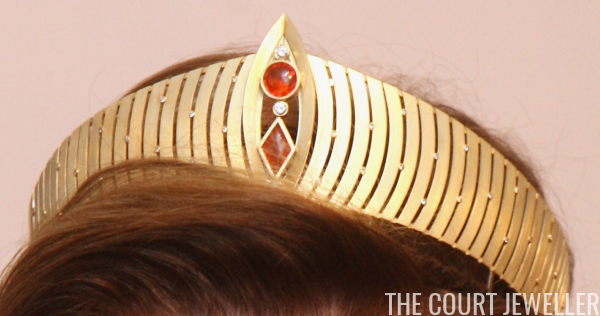 When she wears the gold and diamond version of the tiara, she can also change out the orange topaz element in the choker for a diamond-and-gold piece. And on top of all of that, she's also worn the topaz version of the tiara with another pair of earrings and a necklace made of gold with orange-colored stones. 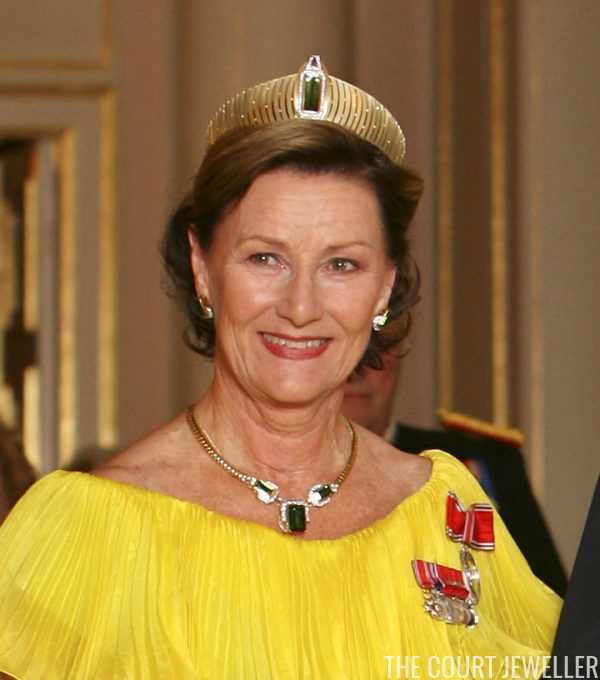 To this day, Queen Sonja is the only member of the family who has been photographed wearing this parure. It's tough for me to imagine someone like Crown Princess Mette-Marit pulling off a set like this, though I think Princess Martha Louise might be up to the task. 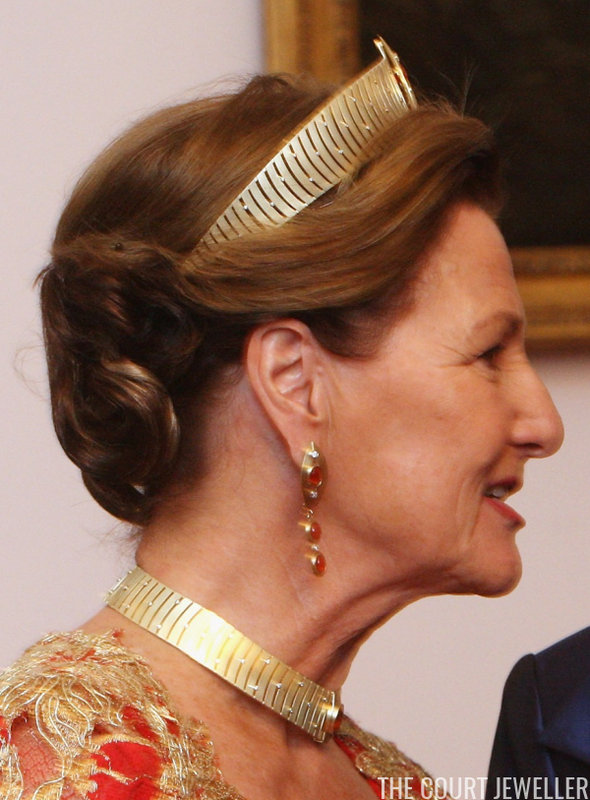 It will be interesting to see whether any other Norwegian royal ladies ever end up borrowing this parure, or whether it will continue to be worn exclusively by Sonja. Note: This is an updated version of an earlier post, with new text/images.